The arrival of a new Vicar shakes up the parish council of a sleepy English village – the Vicar is female and gorgeous. 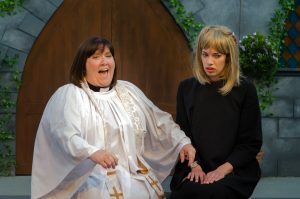 Dibley and its odd-ball inhabitants aren’t yet ready for 20th century progress – or the force of nature that is Geraldine. Cardiff’s annual open air theatre festival has already played host to Spamalot to rave reviews, and a Comedy Gala night staged in aid of Amnesty UK. On Sunday 9 June, Hello Cabaret, featuring a cast of bright and brilliant young Cardiff stars will take the stage for one night only. After Vicar of Dibley concludes, the festival still has much to present with Macbeth as the final main stage show which finish the festival. Not only this but Everyman’s Youth Theatre present “Twelfth Night” on Sunday 23 July and in time for the school holidays, children’s show Disney’s Aladdin Jr round off the entertainment. Now the largest event of its kind outside London, this year’s festival is fast becoming the biggest event in our 35-year history.